The last two decades has seen substantial growth in the use of pressure-sensitive labels for consumer product labelling applications. In the majority of cases a paper facestock is chosen, but where clarity or water or chemical resistance is required, film materials are chosen. Typically, films are produced from relatively thick (40-120 micron) polypropylene or polyethylene and oriented versions where high stiffness for dispensing is required. More recently, large end-users such as the supermarket chains have been leading the drive to either more sustainable packaging or for packaging which may be disposed of in scenarios other than landfill. Increasingly, more food packaging for example is now being made from materials such as polylactic acid (PLA) or from so-called Bio-polymers. Bio-polymers may be defined as “Any polymer derived directly or indirectly from biomass”. For example sugar beet can be converted to glyconic acid, which may be subsequently polymerised to polyglyconic acid. Natural polymers which can be derived directly from biomass include polysaccharides, celluloses, pectins and proteins. Indeed films produced from cellulose, are finding growing use in food packaging applications where there is a need for the package to be biodegradable in either a home or industrial composting environment. Much of this packaging carries a label made from paper, which itself is made from a cellulose base and is therefore also biodegradable and compostable. However the adhesive itself is not compostable, which means that the label must be removed prior to disposal of the package into compost environments. Recent trends in food labelling however, are showing greater use of the no-label look where a clear polymeric film label is replacing traditional paper-based or white wet-glue applied labels which effectively hide the product. Naturally, in the case where a product is being packaged with a clear biodegradable packaging film, if the no-label look is required then the printed label will need to be made from components that are transparent and also biodegradable, so that the overall packaging can meet the biodegradation standards. This presents a particular challenge to the Pressure-sensitive Labelstock industry, as there are few known biodegradable adhesives that are classified as being biodegradable or that meet the standards that have been established such as EN13432 or ASTM D6400. Of the few examples arguably the suitable solution for pressure-sensitive labelling are the hot-melt adhesives based upon polycaprolactone polyesters, which are reported to be fully biodegradable in compost activated with sludge. In addition to this growing trend in the no-label look, new demands on food packaging mean that producers have to provide information on the product’s ingredients or nutritional attributes. The increasingly widening range of pack sizes also means that the information provided is different for each pack size and food manufacturers are meeting these challenges with self-adhesive labels, which allow labels to be applied to products late in the production stages. Thus, with the increasing use of sustainable or biodegradable packaging materials, it is a natural progression for the pressure-sensitive label to also be made from such materials. This will further fuel the need for the development of biodegradable adhesives and printing inks to ensure full compliance with the biodegradation/ composting standards. In this present study, the definitions of biodegradable, compostable and sustainable have been explored in greater depth along with a view on which materials could be used to construct a pressure sensitive label. The properties of a cellulose facestock film, a PLA and a BOPP film are then described along with the results of an extensive study of the their properties relating to their use in labelling. In a recent article the UK National Non-Food Crops Centre (NNFCC) has attempted to clarify the terms “Biodegradable” and “Compostable” and also offered an insight into how renewable polymers can contribute to the development of a sustainable supply chain. The article defines Biopolymers as “any polymer derived directly or indirectly from biomass”. Thus, included are natural polymers such as polysaccharides, celluloses and proteins as well as synthetic polymers prepared from naturally-occurring monomers that are extracted or produced from biomass, for example polylactic acid (PLA) and polyhydroxyalkanoates (PHA’s). The term Biopolymers also covers those synthetic polymers that are polymerised from synthetic monomers whose source is biomass, for example polyethylene made from ethylene which has been converted from bioethanol. A useful definition is also provided for Biodegradation: “biodegradation means that a polymer can/ will be degraded when exposed to microbial, enzymatic or other biological action into carbon dioxide (CO2), water and other compounds”. The terms biodegradable and compostable are often confused and a further definition attempts to clarify the difference: “in order for a material to be designated as compostable it must be demonstrated that it will biodegrade and disintegrate in a controlled composting system under standard test conditions”. There are various standards covering the criteria for inclusion of biodegradable materials in compost. These standards define the degree of biodegradation that has to occur in a specified timeframe and the levels of disintegration required for the polymer within the compost. This generally means that biodegradable polymers must be used in appropriate forms (e.g. thin films) such that they can breakdown sufficiently in the timeframes specified. The above definitions serve as a useful background to the concept of a biodegradable label. However, a more useful demonstration of the label’s need could be provided by defining the construction of a pressure-sensitive label that would meet the requirements of EN13432. What EN13432-compliant film materials are available? Cellophane (regenerated Cellulose based on wood pulp) is probably the well-known biodegradable film having been around since the early 1900’s when it was discovered that viscose could be cast onto cloth to form a transparent film. For many years prior to the recently arrived polymers, cellulose has been recognised as, and indeed is, the reference standard versus which other biodegradable materials are typically tested for complete biodegradation. The basic tests, e.g. as specified in EN13432 usually involve immersing materials in a standard compost and measuring the evolution of carbon dioxide in a specified time period as the micro-organisms assimilate the material. Until recently however, cellulose films have relied upon non-biodegradable coatings in order to produce films having appropriate moisture-barrier or sealing properties for various packaging applications. However, a new generation of cellulose films from Innovia Films, marketed under the Natureflex trademark, employ biodegradable coatings which ensure full-compliance with the international standards for composting, which typically only allow small quantities of non-biodegradable materials to be present. Included in this new generation of films is Natureflex NVL, a transparent 45 micron grade specifically developed for pressure-sensitive labelling applications. Natureflex NVL has high dimensional stability, sufficient thickness for efficient dispensing and biodegradable high performance print and adhesive-receptive coatings. Other examples of biodegradable films are those produced using polylactic acid (PLA). PLA is linear aliphatic polyester, produced by polymerisation of lactic acid, with the lactic acid having been made by fermentation of sugars obtained from corn or other biomass. Degradation of PLA occurs via ester hydrolysis by water to form lactic acid and other small molecules, which are decomposed by microbes in the compost environment. Both Natureflex and PLA will pass EN13432, the key difference being that PLA requires the high temperatures (~ 60oC or more) developed during industrial composting for degradation to be initiated while the Natureflex films will biodegrade at both elevated and ambient temperatures, rendering them suitable for both industrial and home composting for their disposal. Natureflex and PLA films are well-known examples, but other examples include the recently EN13432-approved cellulose diacetate films from Clarifoil, which differ from Natureflex principally in their thermal characteristics, modulus and barrier performance. Each of the new breed of biodegradable films mentioned have significantly different properties to the traditional polyolefin-based films used in pressure-sensitive labelling such as polypropylene and polyethylene. As the demand for biodegradable label films increases, the industry will need to adjust the conversion processes accordingly to account for differences in film stiffness, dimensional stability, print-receptivity etc., engaging the technical services resources available from the respective film suppliers to ensure efficient conversion of the new films. The following section explains some of the fundamental physical properties and discusses their relevance to the pressure-sensitive label converting industry of two new biodegradable label films, Natureflex NVL and a 50 micron PLA. Included is a comparison with a 50 micron BOPP film made by the bubble process, in order to provide a view on how conversion of the new films might differ relative to BOPP. One of the key properties of a film in labelling is its performance under tension. Films must be able to withstand the tensions needed to give good layflat during adhesive coating and must hold their dimensional stability when subjected to heat. The amount of tension a film can withstand is also related to the stiffness or “modulus” of a film. This is important in dispensing where the facestock requires a sufficient bending stiffness to enable it to easily release from the liner onto the article being labelled. 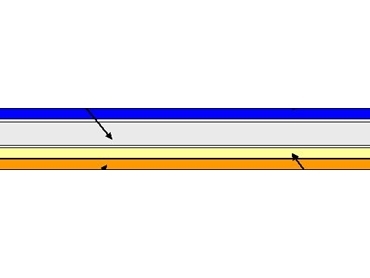 The theoretical dispensing performance of a film can be further highlighted by measuring bending stiffness. While not directly related to the tensile modulus given by a stress-strain curve, bending stiffness is arguably a better measure of the ability of a film to dispense. Another important factor to consider is the response of a film when subjected to heat, particularly as the film will need to withstand the often elevated temperatures experienced during printing, through drying ovens or heat emitted by UV curing lamps. Dynamic mechanical thermal analysis is often used to study how a film’s modulus (stiffness) changes with temperature. NVL gives virtually flat performance in this range, while BOPP continues to show a gradual lowering of its modulus as the classical softening behaviour of a polyolefin is observed in this range. PLA however shows a dramatic loss of modulus at 60 oC which can be attributed to the glass transition temperature of the material (Tg). Tg is associated with the enabling of large scale molecular rotation and movement where the polymers chains effectively come out of their locked-in or “frozen” state and the polymer exhibits a transition from glassy to rubbery behaviour. In comparing the three materials, it may be expected that NVL is stable at the typical temperature that might be observed in a printing press. BOPP shows lower thermal stability and care would need to be taken not to allow PLA to approach such temperatures in case of potential print registration issues. These speculations are obviously related to unsupported film and do not account for any additional stability that may be afforded by the film in adhesive laminate form. One area where BOPP has shown to have good performance is in die-cutting. As opposed to paper, oriented polypropylenes show high resistance to tearing, thus enabling labels with high quality edge appearance after punch die-cutting. Several new biodegradable facestock films are now available meeting the requirements of the composting standard EN13432. This present study has shown that both Natureflex NVL and PLA films have good potential for use as pressure-sensitive facestock materials, giving performance similar to or sometimes better than BOPP in many of the key technical areas important in the pressure-sensitive label converting industry. While other important factors have not been considered by this study, e.g. print-performance, it is the intention in future articles to address this and other factors such as real-life dispensing performance and storage/ handling considerations which are considerably different to those required for the traditional polyolefin films which are well-known in this industry. While it is apparent that suitable new biodegradable label facestock films, conforming to EN13432 are available now, the challenge remains for the industry to develop suitably-compliant pressure-sensitive adhesives and inks to ensure compliance with the emerging standards is facilitated.